Sherlock Holmes' quick eye took in my occupation, and he shook his head with a smile as he noticed my questioning glances. "Beyond the obvious facts that he has at some time done manual labour, that he takes snuff, that he is a Freemason, that he has been in China, and that he has done a considerable amount of writing lately, I can deduce nothing else." Mr. Jabez Wilson started up in his chair, with his forefinger upon the paper, but his eyes upon my companion. "How, in the name of good-fortune, did you know all that, Mr. Holmes?" he asked. "How did you know, for example, that I did manual labour. It's as true as gospel, for I began as a ship's carpenter." "Your hands, my dear sir. Your right hand is quite a size larger than your left. You have worked with it, and the muscles are more developed." "Well, the snuff, then, and the Freemasonry?" "I won't insult your intelligence by telling you how I read that, especially as, rather against the strict rules of your order, you use an arc-and-compass breastpin." "Ah, of course, I forgot that. But the writing?" "What else can be indicated by that right cuff so very shiny for five inches, and the left one with the smooth patch near the elbow where you rest it upon the desk?" "The fish that you have tattooed immediately above your right wrist could only have been done in China. I have made a small study of tattoo marks and have even contributed to the literature of the subject. That trick of staining the fishes' scales of a delicate pink is quite peculiar to China. When, in addition, I see a Chinese coin hanging from your watch-chain, the matter becomes even more simple." Mr. Jabez Wilson laughed heavily. "Well, I never!" said he. "I thought at first that you had done something clever, but I see that there was nothing in it, after all." 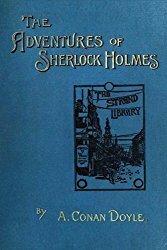 When one first reads the Sherlock Holmes stories (or any detective, crime, or murder mystery stories), one is of course reading for sheer pleasure and enjoyment. For many of us, however, there comes a point (usually after we read through the stories a number of times) when we ask ourselves, "How did Conan Doyle achieve this effect on me? How did he manage to keep me so absorbed in the story? How did he manipulate my emotions so I felt anger toward one character, sympathy for another, or disdain for a third?" We then begin to examine the stories on another, deeper, level. We ask, "What story elements did Doyle use more than once? What devices or tools did he pull from his bag of tricks? And how did he manipulate them so story after story seems fresh and surprising?" The purposeful use of fire to create a diversion is used more than once. A hidden room or compartment is discovered by measuring the outside of the house and comparing those measurements with those taken from inside the house. Extra space is accounted for only by the revelation that there is a secret compartment. The criminal hides a stolen item of value in an object, planning to retrieve it later. He then discovers that there are multiple objects which have remarkably similar markings -- and these have been distributed so that he must now track them down. An eccentric man attempts to prevent the marriage of his daughter or step-daughter in order to maintain control of her inheritance for his own purposes. An innocent person is falsely accused of a crime. In some of these cases, he loses the faith of his family, who suspect him; in other cases, his family stands by him. A flim-flam setup or diversion is created in an attempt to lure a victim off certain premises. A particularly nasty villain appears. Ciphers and secret codes occur in several stories. It is easy to get carried away and continue to think of more and more elements that are used two, three, or more times by Doyle. There are, of course, categories of crimes that are repeated -- disappearances, abductions, burglaries, robberies, murders.... Our news is full of such common atrocities and our jails filled with perpetrators (or on occasion a wrongly accused innocent). 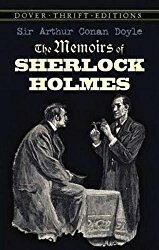 Many Holmes stories center around a lesser crime than murder, though all of the novels include murder. In at least one story, there is no crime at all. So how is Doyle able to translate something borne of reality into fiction repeatedly, and yet continue to surprise and delight the reader? When you have the time and the inclination you may wish to compare the following groups of stories. What are the common elements and how are they combined in various ways to produce different effects in different stories? "A Scandal in Bohemia"; "The Norwood Builder"
"The Blue Carbuncle"; "The Six Napoleons"
"The Greek Interpreter"; "The Solitary Cyclist"
"The Naval Treaty"' "The Second Stain"
"The Speckled Band"; "The Copper Beeches"
"The Beryl Coronet"; "The Bruce-Partington Plans"; "The Norwood Builder"
"The Crooked Man"; "The Red Circle"; "The Adventure of Wisteria Lodge"
"The Red-Headed League"; "The Resident Patient"; "The Stockbroker's Clerk"; "The Three Garridebs"
"Charles Augustus Milverton"; "The Illustrious Client"
"The Noble Bachelor"; "The MIssing Three-Quarter"
We [Holmes and Watson] were fortunate enough to catch an early train at Waterloo, and in a little under an hour we found ourselves among the fir-woods and the heather of Woking. Briarbrae proved to be a large detached house standing in extensive grounds within a few minutes' walk of the station. On sending in our cards we were shown into an elegantly appointed drawing-room, where we were joined in a few minutes by a rather stout man who received us with much hospitality. His age may have been nearer forty than thirty, but his cheeks were so ruddy and his eyes so merry that he still conveyed the impression of a plump and mischievous boy. "I am so glad that you have come," said he, shaking our hands with effusion. "Percy has been inquiring for you all morning. Ah, poor old chap, he clings to any straw! His father and his mother asked me to see you, for the mere mention of the subject is very painful to them." "We have had no details yet," observed Holmes. "I perceive that you are not yourself a member of the family." Our acquaintance looked surprised, and then, glancing down, he began to laugh. "Of course you saw the J H monogram on my locket," said he. "For a moment I thought you had done something clever. Joseph Harrison is my name, and as Percy is to marry my sister Annie I shall at least be a relation by marriage. You will find my sister in his room, for she has nursed him hand-and-foot this two months back. Perhaps we'd better go in at once, for I know how impatient he is." Note: This is the first of three related articles. See Part 2: "The Adventure of the Speckled Band" and "The Adventure of the Copper Beeches" and Part 3: "The Adventure of the Cornish Boatman". "The Red-Headed League" is in The Adventures of Sherlock Holmes. "The Naval Treaty" is in The Memoirs of Sherlock Holmes.